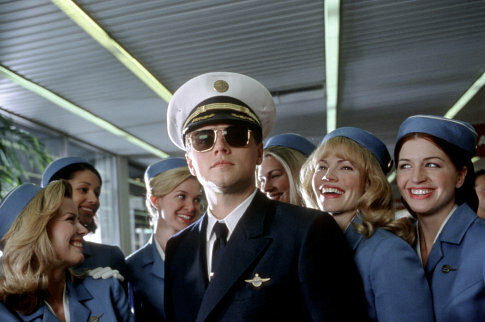 In future years, I will remember "Catch Me If You Can" as the film where I finally learned to respect Leonardo DiCaprio. Without having seen his acclaimed work in "What's Eating Glibert Grape", I saw him as a very limited actor; his performance in "Titanic" was overblown and uninspired, and the other films he has decided to appear in since then... well, let's not go there. However, seeing him as Frank Abagnale Jr. in Steven Spielberg's second film this year, I understand now what everyone was going gaga over back in 1997. What I see is not the unsure teen idol of five years ago, but a charismatic, mature performer who just may be Hollywood's new leading man. "Catch Me If You Can" is the (true) story about Frank Abignale Jr. (Leonardo DiCaprio). When he was an early teen, his parents (Nathalie Baye and Christopher Walken) divorced, leaving him confused and unsure of what to do with his life. He remembers when in high school he impersonated a substitute French teacher, and after seeing a pilot decides that he wants to try his luck as a con man. He starts as a pilot, pretending to "dead head" (i.e., get a free ride) all around the world. He starts to make fake checks, IDs, etc. Soon he catches the attention of Carl Hanratty (Tom Hanks), an FBI agent specializing in Bank Fraud. And so begins the chase, as Frank goes from job to job, and Hanratty only gets closer and closer to capturing him. When Spielberg goes and tries to tackle something a little more serious, he's been accused (multiple times) of softening up the overall impact or somehow petering out in the end. With smaller, more lighthearted bits like "Catch Me If You Can", Spielberg is strong all the way through. With screenwriter Jeff Nathanson, he brings something extra to "Catch Me" that other filmmakers might miss out on (I personally think he should do more work with Nathanson in the future). Spielberg has always been concerned with father-son relationships in his films ('Minority Report" is just one example). In "Catch Me", it actually makes the film better to have it here. Abignale's lack of a mentor or father figure gives the film its heart and backbone, turning what could've been a pure romp into something with a little more meat. Abignale becomes not just a genius having a great time, but a lost, naive kid looking for some way to settle down. The only thing I wish the film could have put in is something that would've made this a more complete picture: what about all the people Abignale hurt? It would've added an interesting conflict to see if Abignale could recognize all the people he left by the wayside as he conned them out of not just their money, but in some cases their dreams (look at the whole situation with the flight attendants or with fiancee Brenda (Amy Adams)). Maybe that was the point; that Abignale was blind to this fact, but still, it would have made the film that much more interesting. Much to Spielberg's credit, he turns "Catch Me If You Can" mostly over to the performers, who are all uniformly excellent. Tom Hanks' Hanratty, constantly befuddled and amused with Abignale's efforts, is wonderful with his thick Massachusetts accent and is a much more interesting presence here than his almost emotionally empty performance in "Road to Perdition". Christopher Walken again proves just why he's such a great actor. However, the performance that impressed me the most was indeed from Leonardo DiCaprio. I can reiterate exactly what I have said above: this is the standout element of this movie, and I hope from here he continues to make smart choices like he has made by going for this role in "Catch Me If You Can". With "Catch Me If You Can", Spielberg has gone for giving his audience a fun time at the movies while still going the extra mile to make sure that it doesn't move along too quickly or get stuck in unbelievable sentimentality (I never ever thought I would say that about Spielberg). Without a doubt, this year is one of Spielberg's best in ages, and "Catch Me If You Can" only gives more proof as to just why this is and why he is one of the most looked up to filmmakers in the buisness. Christopher Walken .... Frank Abagnale, Sr.
"Catch Me If You Can" is rated PG-13 for some sexual content and brief language.